"Sampath Speaking" - the thoughts of an Insurer from Thiruvallikkeni: Veerapandiya Kottaiyile ~ will Bharat Arun become the bowling coach ? Veerapandiya Kottaiyile ~ will Bharat Arun become the bowling coach ? Veerapandi Kottaiyile ~ a song scene from Thiruda Thiruda movie released in 1993. A story you would often see in Hollywood ~ printed currency from the Govt Press – of a huge value, a container load – getting stolen by a foreign operative – access card gets into possession of a singer – incomes some locals too – hot chase and all stuff. The CBI officer is the burly SP Balasubramanian – two small time burglars, on the run comes in between – the container gets hidden behind straw .. the movie at that time was interesting – though Mani Ratnam’s films of those days when seen now look a bit comical and ordinary !! Ravi Shastri is back and my Q on how many Tests he captained did get only 2 correct answers – that of Chepauk Pongal Test 1988 when Narendara Hirawan, Ajay Sharma and WV Raman made their debut. Back at the helm as chief coach of the Indian cricket team, Ravi Shastri is set to pitch for the return of bowling coach Bharath Arun despite the presence of Zaheer Khan in their ranks. Those who follow Indian Cricket and specifically Raavi Shaastri - know his penchant for Bharat Arun ~ but there perhaps some fissures in the political cauldron of Indian Cricket administration that Cricket Advisory Committee (CAC) did not take the new head coach into confidence while recommending Zaheer as the bowling coach although his role would be similar to that of Rahul Dravid --- that of a consultant. There are news circulating that Zaheer is unlikely to give around 250 days a year that a full-time bowling coach will be required to and may not be available for more than 100 days ~ and his package too is under negotiation still. Does that not sound a bit queer that somebody’s whose selection has been announced has things yet to be sorted out. 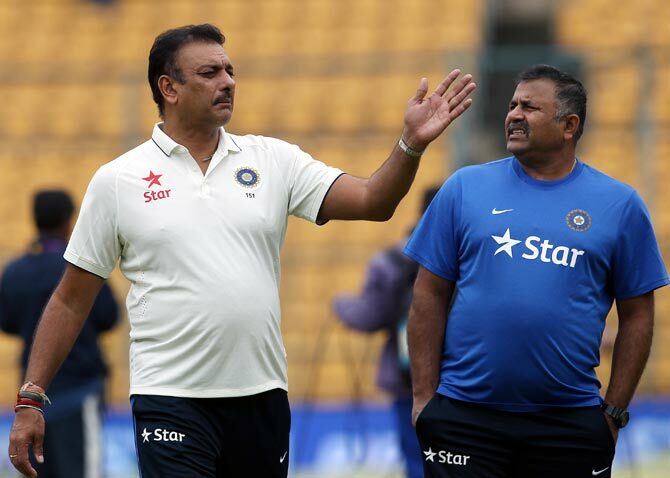 Ravi Shastri is reported to have bargained for Jason Gillespie (the man who scored a 200 in his last test innings) as bowling coach ! - but he is under contract with Papua New Guinea. Media reports put that Shastri is expected to meet the top officials and the Committee of Administrators (COA) during the weekend as he is expected to cut short his trip to United Kingdom. Arun had replaced Joe Dawes in 2014 and was there with the Indian team till 2016 when Shastri was dumped. Remember Bharat Arun turned up regularly for Tamilnadu and a few matches for India – did not have great achievements but has been regarded as good coach and has got a rapport with Shastri dating abck to their U 19 days of early 1980s. Arun played in 2 tests – made 4 runs – had 4 wickets and in 4 one dayers took a solitary wicket. His test debut was against Sri Lanka at Kanpur in Dec 17,1986 and his ODI debut came a few days later at the same venue against the same opponents. Remember watching him run in to bowl his maiden ball in his International career, and as he crossed the Umpire, his ankle twisted, came down a cropper, falling – that his was first ball !! The Mani Ratnam + Gopal Varma movie ‘Thiruda thiruda’ had Prashant, Anand, Heera and Anu Agarwal - Anand is the brother of Bharat Arun.